Ekornes Stressless Oasis Fabric Recliner and Ottoman. 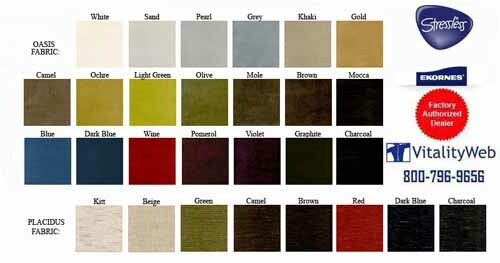 Stressless Oasis Fabric - Stressless Oasis Fabric provides the widest range of color choices, Oasis is a go-to choice. Delivering a sensual, velvety texture of 100% Polyester. 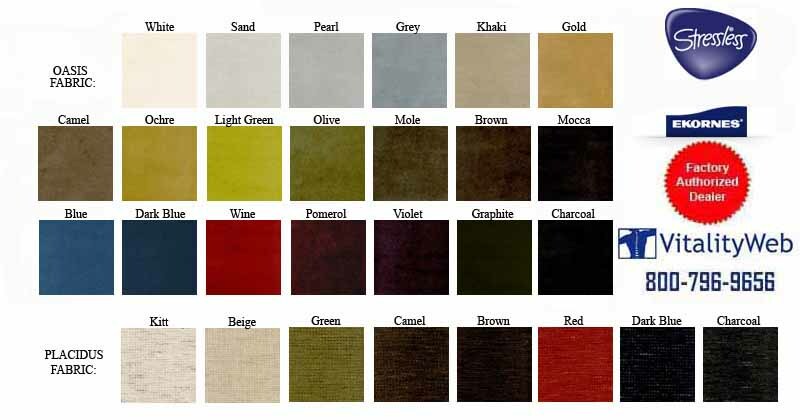 Stressless Oasis Fabric is a "hard use" fabric option, particularly resistant to daily abrasive use. It's washable, at 40 degrees or with a furniture foam cleaner. You've got to feel it. EKORNES® Stressless Chair fabrics can be trusted to deliver long life, warmth and comfort. Every fabric has been tested extensively to endure either heavy duty or normal use. All "hard use" fabrics are acceptable for families with children. All their textiles exhibit beautiful textures, ultra smoothness, timeless design and usefulness for any décor. They already meet the strictest furniture industry standards respecting nature, light tolerance and flammability.